To address the needs of those who cannot help themselves we must give them more than just our good wishes. Yet the West, despite its relative wealth, cannot afford to fund the entire welfare budget of the rest of the world. Most Western governments have trouble meeting the needs of its own citizens so any attempt to take on the full burdens of those who are in abject poverty is unrealistic. Instead the West must target its spending on helping nations to help themselves. By investing more money in the short term we can help developing nations invest in the education and equipment that they need to grow their economies for decades to come. The potential benefits from economic growth are huge, and are seen clearly in how the West has itself developed from the miserable poverty of the Middle Ages to the affluence of the 21st century. China and India provide modern examples of how nations which were once sunk in poverty have, following two decades of rapid growth, become much more prosperous allowing millions of their inhabitants to break free from the horrors of poverty. The size of a country�s economy is measured by adding up all of the goods and services that it produces in a year. If a country can continually increase how much it produces, it will also continually increase its wealth. Even moderate rates of growth, if sustained for many years, can radically change a nation�s prosperity. For example, a country which grows at a rate of 3.6% per year will be twice as wealthy after twenty years. This means that on average each of its citizens will be able to afford double the food, double the clothes and double the medicine that they could two decades earlier. It should also be noted that if incomes rise then Government receipts from income tax will also rise, allowing it to invest more in education, more in health and more in the infrastructure of the country. The problem for Third World countries is how to generate the growth which they so desperately desire. 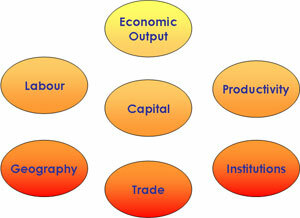 Economic theory tends to focus on several factors which are shown in the following diagram. The amount an economy produces depends on its quantity of inputs, usually referred to as labour and capital, and how effectively it turns these inputs to outputs (productivity). The more workers (labour), the more equipment (capital) and the more skilled and efficient the workers and equipment are (productivity) the better. The amount of labour and capital in an economy, and its productivity, are themselves influenced by other factors such as the climate and position of a country (geography), how much it buys from and sells to other countries (trade) and how effective the government is (institutions). By targeting these factors it should be possible to affect the whole economic condition of the nation. Before looking at these reforms it is important to note that economic growth on its own is less effective at reducing poverty if all of the wealth stays in the hands of a small elite. We do not support radical redistribution but it is essential that all members of society, regardless of their background, have equality of opportunity. By equipping everyone with skills, healthcare and basic needs they can go on to fulfil the potential which lies in every human being, and the society as a whole will be much better off. On the following pages we will be looking at the different aspects of development, and at how these factors can be reformed to produce the best outcome for society.